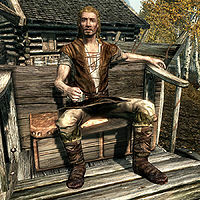 Sigaar is a Nord warrior, and the carriage driver in Riften. For a fee, he can transport you to any of the other major cities in Skyrim. Sigaar wears a set of farm clothes and a pair of boots. He is equipped with an iron war axe. If you ask him to tell you about Riften, he will respond,"You can get a room at The Bee and Barb, but mind your coin purse -- it's no secret the Thieves Guild makes its home here. Oh, and if you meet Maven Black-Briar, stay on her good side. This is her city, and nobody else's." This page was last modified on 9 October 2014, at 23:48.